Broader focus on all lineages of life forms in nature. Wider range of topics, ranging from biology and medicine to chemistry and materials science. Expanded international editorial board representing a wider range of expertise. Wider range of contributing authors with expertise in specific areas. Greatly expanded monosaccharide symbol nomenclature for the representation of glycans. Greater attention to informatics, and integration with databases on other classes of molecules. "The field of glycobiology has matured. The comments of Nobel Laureates on the previous editions reflect the long-held belief that central functional roles played by the diversity of glycan chains would be revealed by research in this field. Now, as the result of advances in analytical chemistry and much deeper understanding of genomes, cell and tissue organization, this field has arrived. The third edition of Essentials of Glycobiology stands as the authoritative treatise on the subject, covering all aspects of the field and written by the world leaders in current research." "Difficult to analyze and synthesize artificially, glycans are often simply ignored. To do so is to avert one's gaze from an important part of life. More than mere decoration, glycans magnify the diversity of the already diverse molecules to which they are attached, affect protein folding and stability, direct traffic within cells, serve as signposts of self vs. non-self, create barriers that protect us, and conversely, defend microbes, making some of them the pathogens they are. It is hard to imagine a world without complex sugars, but if such a world existed, it would be much diminished. The third edition of Essentials of Glycobiology may be life changing for scientists who have not yet engaged with glycobiology and will certainly be a treasured resource for those who already have." "The importance of glycans has long been recognized and great advances have been reported on the synthesis and chemical analysis of this class of natural compounds. In my field, structural biology, carbohydrate moieties in glycoproteins and in complex multi-component macromolecular systems have been and continue to be difficult to handle. I greatly welcome the effort made in this multiauthor volume to present results obtained with methods of structural biology in the context of the wealth of currently available chemical and biological data. 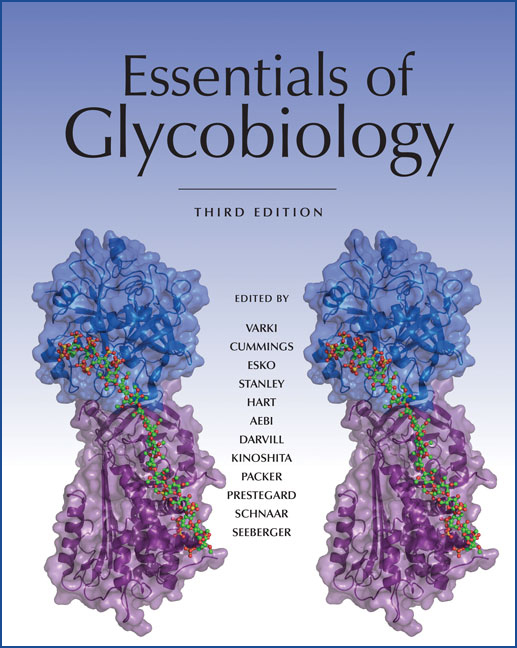 I recommend the third edition of Essentials of Glycobiology as a highly useful reference on the current state of the field." "We think conventionally of the immune system as having evolved to deal with invading pathogens that express "foreign" proteins (and peptides), targeted via specific recognition units, particularly secreted antibodies and cell-bound T lymphocyte receptors. As the molecular revolution has unfolded, such science that relies on a reasonably direct correlation between genotype and phenotype has been relatively straightforward. Much more difficult to assess is the part played by glycosylation profiles in immune recognition and pathogen elimination. Perhaps even more intriguing is the issue of glycan abnormalities and recognition in cancer and many other disease processes. Now, in a third edition of Essentials of Glycobiology written by authoritative leaders in the field, we learn how this knowledge has been rapidly advancing, and see possibilities for real breakthroughs in understanding and therapy."